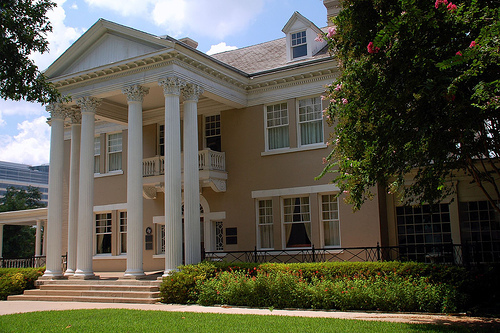 The Dallas Association of Young Lawyers is headquartered in the heart of the Dallas Arts District at the Belo Mansion, 2101 Ross Avenue, Dallas Texas 75201. Parking is available in the Belo Mansion parking garage for $4 if you’re attending a DAYL or Dallas Bar Association event. The Belo Mansion provides regular lunch service during all days where there is a lunchtime event occurring. Lunch is available for purchase. If the parking garage is full, additional parking is available at the Cathedral across Pearl Street. The DAYL Executive Director is Cherie Harris and she can be reached via email (cherieh@dayl.com) or via phone (214.220.7420). The DAYL fax number is 214.220.7422. You can find us on Twitter (@dayltweets) or on Facebook (www.facebook.com/dallasyounglawyers).